Below are past building material and real estate auctions conducted by Lambrecht Auction. We have completed many real estate and building materials auctions at liquidation pricing in and around the Bainbridge, NY location. We offer flooring liquidation, lumber liquidation, wholesale kitchen cabinets, and more! Contact us today to learn more or view our upcoming auctions to view the next building material liquidation auction near you! Having updated our own trucks, we will be selling them along with other consignments at our Bainbridge Auction Facility. Save On Building Materials & Home Improvement Needs Including; Kitchen Cabinet Sets, Flooring, Doors, Kitchen & Bath, Tools, Lumber, Appliances, Roofing, Decking, Plywood, & Much More! Final Catalog Posted Under Documents Tab! Save Big On Building Materials & Home Improvement Needs Including; Kitchen Cabinet Sets, Flooring, Doors, Windows, Kitchen & Bath, Tools, Lumber, Appliances, Roofing, Decking, Plywood, Pavers, Stone, Siding & Much, Much More! Final catalog is posted under the documents tab! Live Auction Fundraiser to help a dedicated Employee who is undergoing severe hardships due to Cancer. Special Auction Items Including 3 Luxury Trips, Raffles, Many Auction Items, and More! Proceeds Benefit Gary & Family. We have been commissioned to sell the following from the Estate of Betty Shampang. Selling over 400 lots including appx. 200 rifles, shotguns, & handguns plus all kinds of ammo & accessories from 4 estates and other consignors plus 40+ mounts donated to the NRA Foundation. Online Building Material Auction held in conjunction with Absolute Auctions and Reality! 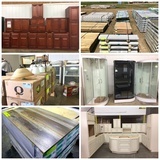 Kitchen Cabinet Sets, Windows, Doors, flooring, lumber, high-end kitchen and bath, and much more! We have been commissioned by the estate of Evelyn Graves to sell the following personal property and real estate at Absolute (unreserved) Public Auction.